Here are some of the gift cards I gave this year. I like how quick they were! I just sealed an envelope , folded it in half meeting left and right sides together, then trimmed those ends off. Then took a piece of DSP big enough to cover and used SNAIL to adhere it on. Then popped the gift card in one pocket and a little note in the other, tied shut with a ribbon, and hung a little tag off the front with To and From on the back of the tag. Very quick and pretty! And here are a few more! 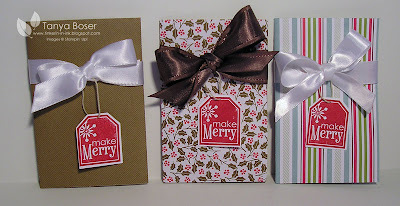 I gave a lot of gift cards this year ;) And doesn't that satin ribbon just look luscious?! We will be able to get it in many more colors on January 5th! I know, I have been absent so much the last couple weeks! It has just been so busy for me, just like for all of you. But I'm back and I will be posting frequently again. 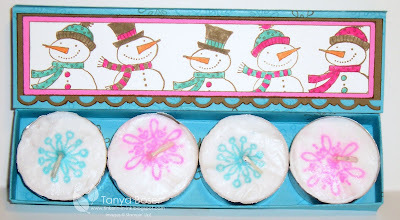 And here are more tea light boxes boxes, I just had to make some for family for Christmas :) This one is with the Snow Buddies set that I just got. I wish I had gotten it earlier in the season! 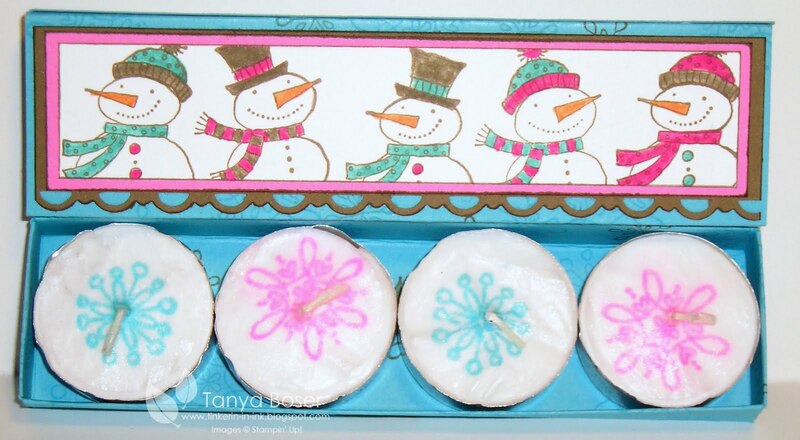 This one also uses the Snow Buddies set, but just the snowflake stamps. I also used the Scallop Trim edge punch on this one. You can find the tutorial to make these boxes here. Here is a card I made as a special order for a co-worker. It is full sheet of card stock folded in half, so it's a BIG card! 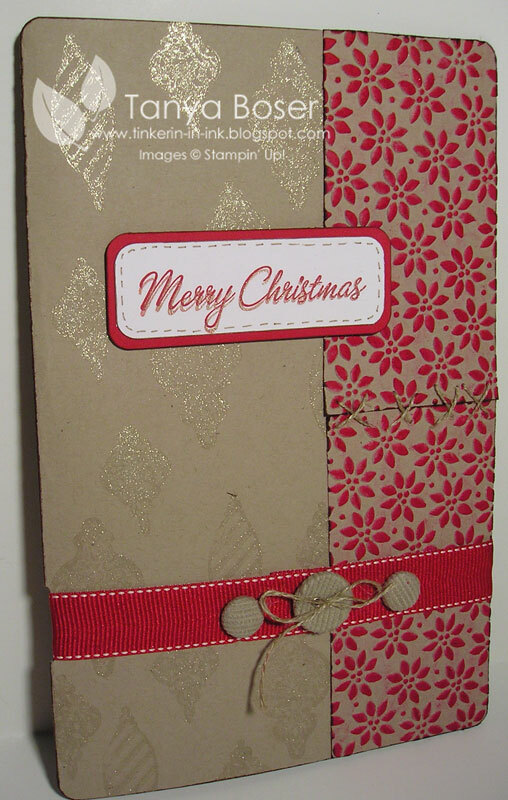 I ran a couple pieces of Kraft thru the Big Shot with the Petals-A-Plenty embossing folder, then rubbed a Real Red ink spot. 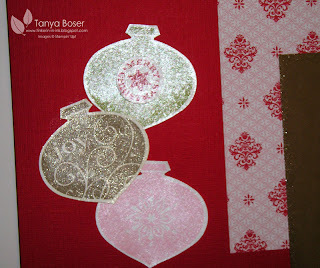 I also stamped ornaments all over the card base with Shimmer Paint. I finally got to use some of my corduroy buttons! 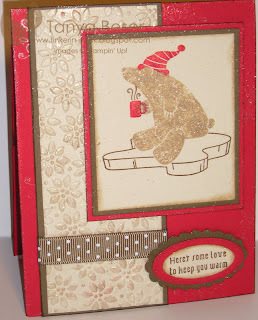 This is another of the projects that we did for December stamp club. It would make a great gift for any family member to fill with photos of their own dear ones, or with photos of yours The tins ( #108333) are on sale on the Clearance Rack on my demo site for 99 cents while supplies last! From a 12×12 piece of Choc Chip cardstock, cut two 5″ x 12″ strips. Then take the 2″ x 12″ scrap and cut off a 4″ strip, then cut down to 1″ x 4″. 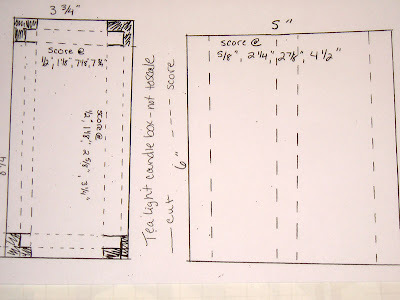 Score the 5″ x12″ strips at 4″ and 8″ and accordian fold. Then overlap 2 sections and adhere with Sticky Strip. This forms a 5 section long mini album. Use the corner rounder punch on all corners. 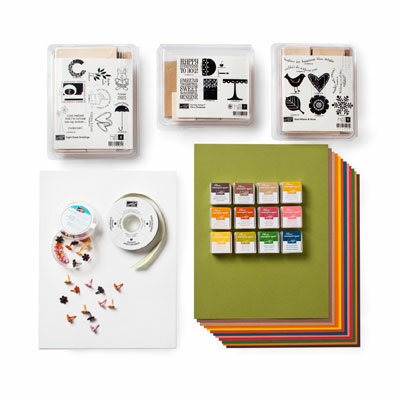 Decorate mini album as desired with strips of designer series paper. Use white gel pen to create faux stitching on each section. Take a 4″ x 5″ piece of Old Olive and use corner rounder punch on each corner. Stamp with the elephant in Old Olive randomly. Cut out a 1″ x 4″ piece of So Saffron card stock. Stamp with the whale randomly with So Saffron. Stamp the Choc Chip 1″ x 4″ strip with the owl randomly in Choc Chip. Adhere to the Old Olive card stock as shown. Use the white gel pen to create the faux stitching. Ink edges of Old Olive with Choc Chip. Adhere to lid of tin with Sticky Strip. Cut a 5″ piece of ribbon, fold in half andadhere ends together with sticky strip. Put more Sticky strip on on end on the “outside”. Adhere to inside of the lid as picture to create a handle to open the tin with. It is time for me to thin out my collection of stamp sets... I have to make room for more to come! Check out what I have for sale here. 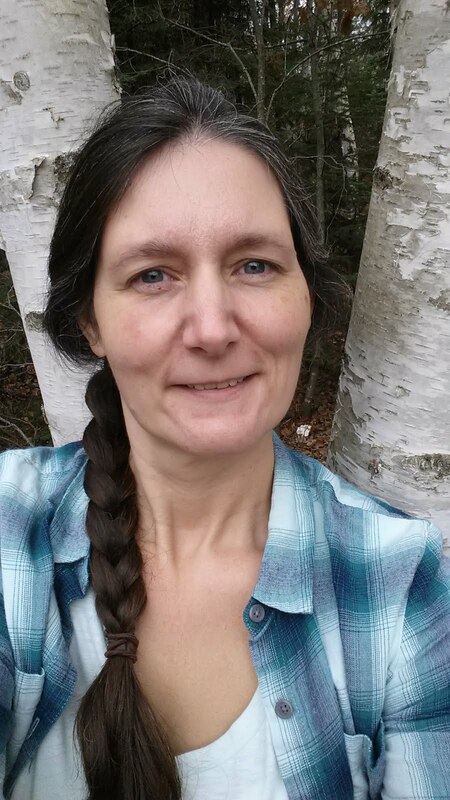 This is a page on a new blog site that I am trying out. Explore a little and tell me what you think while you're over there! Here is a list of the sets I'm selling. There are pictures posted on the sire linked above. PayPal please and priority mail flat rate boxes will be used (will fit as many items into box as possible). 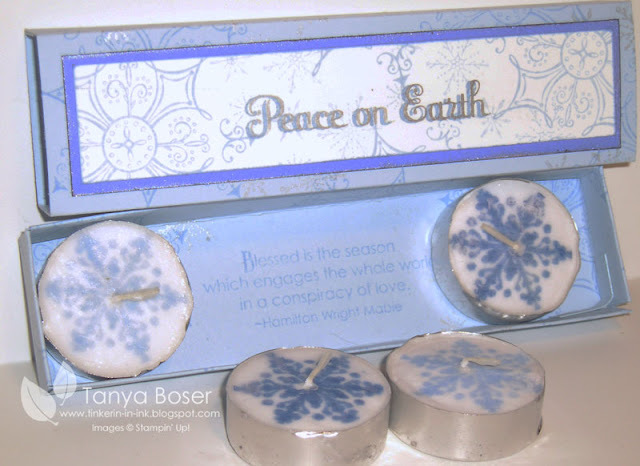 I had to do some more tea light boxes, they are just so nice! 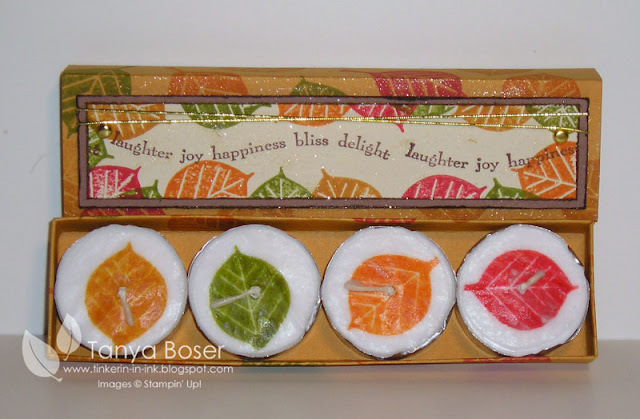 I had made the candles last month and needed to make a coordinating box. As you can probably tell, I accidentally cut too far in on one of the tabs, so I stuck a little strip of card stock into the corner to reinforce it. Not too noticeable I hope! I did use the Frost White Shimmer Paint to stamp the smallest snowflakes all over the box, but there aren't any showing, and I inked the edges of the title pieces with the Frost White also. That you can see :) Wow, I can''t believe I used so many different sets! You sure wouldn't have to. But, I have them, so why not?! More tags! Can't ever have enough tags this time of year, can you? I made a quick batch of these a few days ago and we will be making these at club tonight also. I don't know if I will be giving mine away or using them myself :) I think I will be using the brown packing paper to wrap gifts this year. I think it gives the presents a homemade feel. Don't you love how the Platinum Shimmer Paint just pops on the Chocolate Chip card stock? !I put sitcky strip on the back so these can just be stuck to the gift. 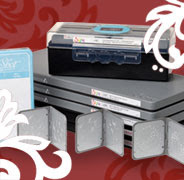 These might be the most exciting 12 days of December with select Big Shot dies and vinyl sheets for the Big Shot on sale! The 12 Days of Holiday Sales begin December 11 and runs through December 22. I did another photo stand with some Christmas Cocoa DSP. We are making this for club this month. I just love Kraft card stock, I don't know why. I have to refrain from using it all the time. Variety is the spice of life you know ;) You could whip out a bunch of these in just a couple hours! 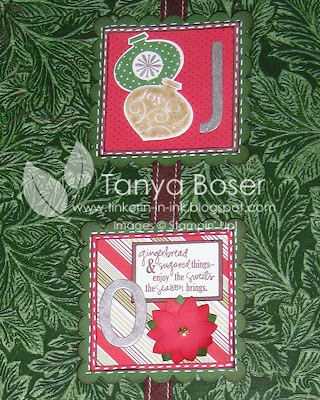 Other: Scallop Square die with Big Shot, Ribbon Originals Mistletoe double stitched white grosgrain, sponge, Stamp-A-Ma-Jig, paper cutter with scoring blade, Distressing tool from Cutter Kit, Sticky Strip. 1. 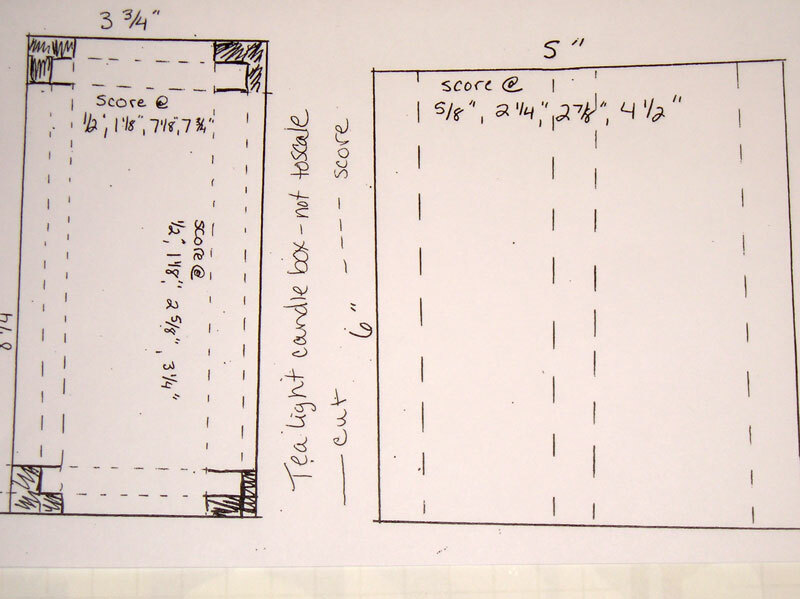 Score large piece of Kraft card stock 4" x11") at 3/4", 5-1/2", and 10-1/4". 2. Crease all score lines. 3. Sponge edges of large Kraft card stock with Soft Suede ink. 4. Sponge edges of scalloped square with Soft Suede Ink. 5. Distress edges of 3" square of Real Red card stock with, then ink edges with Soft Suede. 6. Apply a Mini Glue Dot to each end of the ribbon and adhere to bottom of the Real Red square as shown above. 7. Adhere Real Red square to Scallop square and then adhere to one side of stand as shown. 8. 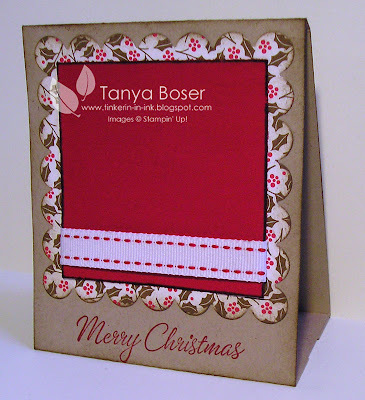 Stamp a greeting or title of your choice below the photo mat in Soft Suede or Real Red ink with the Stamp-A-Ma-Jig. 9. On back, apply Sticky strip to the flaps. 10. 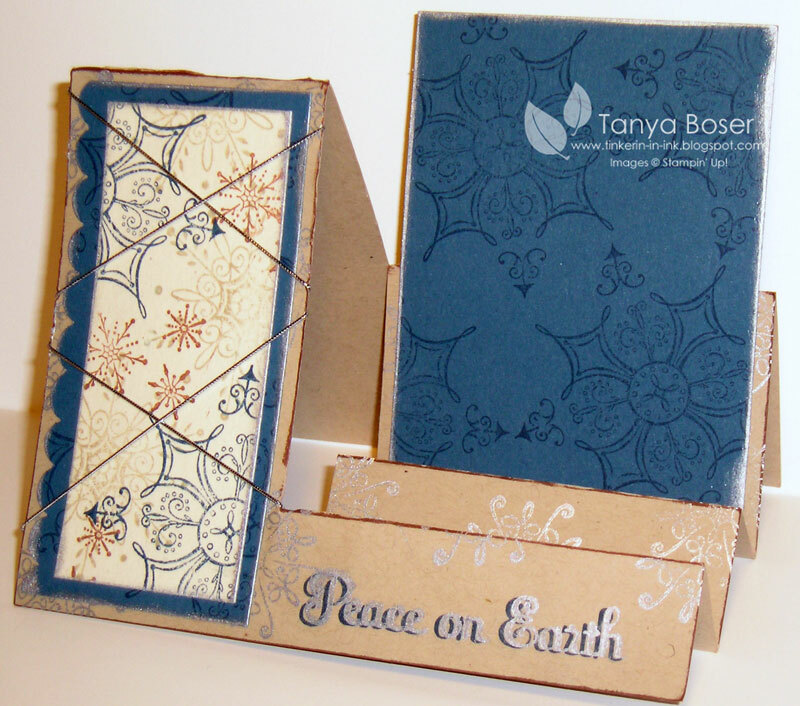 Attach the 2" x 4" Kraft card stock to the flaps to create the stand. *You can attach just one side to the 2" x 4" piece and fold everything up to fit in an envelope and mail after putting a photo on it. You can also decorate both sides for double the fun! *You could also put a message on the back instead of a photo, or a message on the inside. 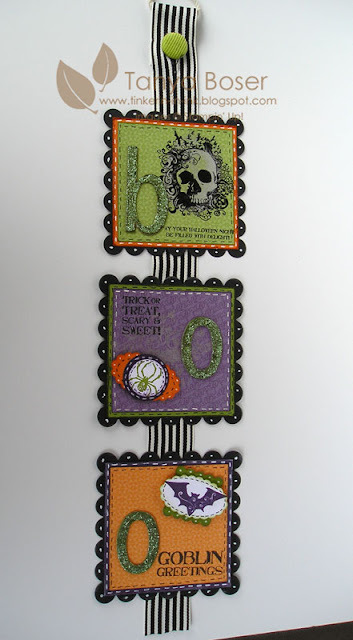 I thought I would do another wall hanging like the Halloween one I did in October. Christmas is my favorite holiday to decorate for, there are just so many traditions you can incorporate! 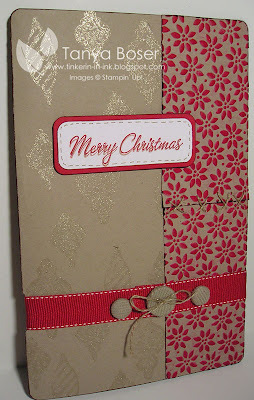 I did end up using more of last year's DSP, but I am trying to use up scraps for anything not for club. I used alot of different supplies for this too. It will be a challenge to remember them all! Here is a close up of the top 2 squares. And the bottom 2 squares. Sorry about the picture quality here. I didn't have the best lighting where I hung this. Now, are you all going to try one? Post a link in the comments so we can see yours! Another Tea Light box. And another Cold & Cuddly project! I can't stop using this set! The full instructions for this project are here. 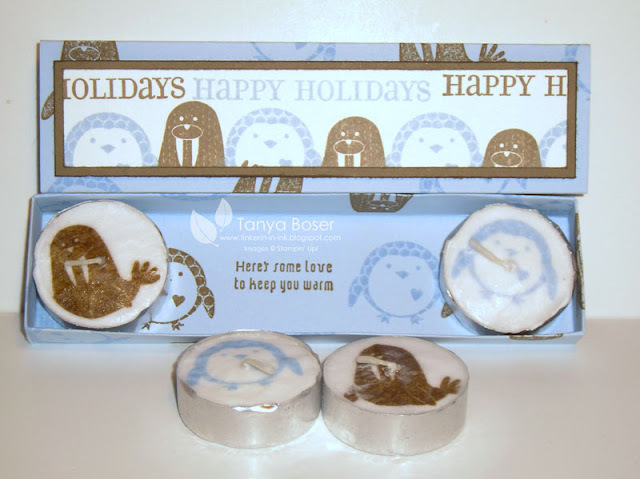 I love how the penguins and walrus are peeking up from the edge on the lid, they make me smile, lol. This wouldn't have to be a Christmas thing, especially if you didn't put Happy Holidays on the lid! 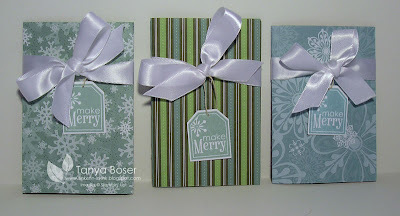 I found another great little idea for a 2 sided gift box using the Box #2 die! I can't give credit to just one person, I have seen this idea in so many places. So easy and fun. I am making a few of these to give to teachers, neighbors, and co-workers for Christmas. 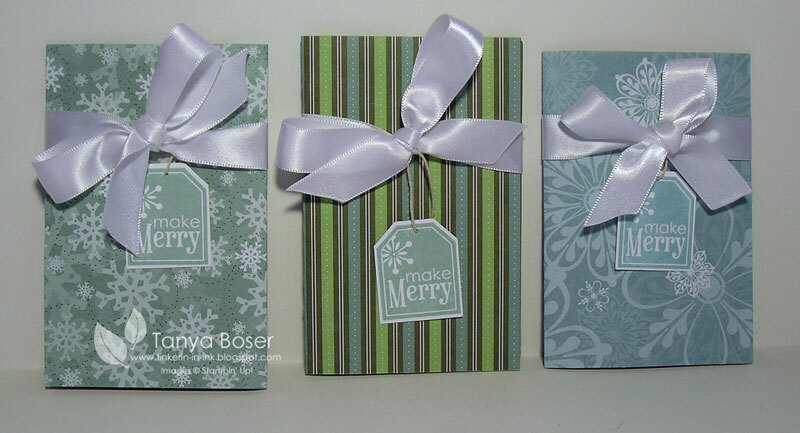 I will fill them with 3x3 cards, candy, and/or gift tags. I used the Large Oval punch to make the cutout handle. And I was able to use some scraps last year's Christmas DSP to decorate the box. It is pictured here holding a few 3x3" cards with envelopes. You could really decorate these up and use them for all kinds of things. I am thinking you could make a cupcake/cake/cookie decorating kit with this too, putting containers of sprinkles and such in it. 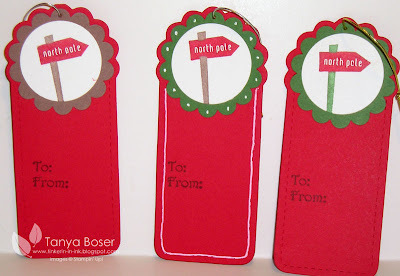 I made some tags by special request for a co-worker and he wanted the North Pole sign from Cold & Cuddly in red and green. So here are the samples I made for him. These tags are so versatile! I have made so many different tags, I am really glad I got the Two Tags die! I have been using this style the most simply because I had a bunch precut but the other tag is great too! Other: Two Tags die with Big Shot, Scallop Circle and 1-3/8" Circle punches, Signo white gel pen, paper piercer, Silver and Gold Elastic Cord. This is the side-step card we did for Club in November. I just so happened to use the same card for a swap, but stepped it up just a smidge and you can see that one at the end of this post. 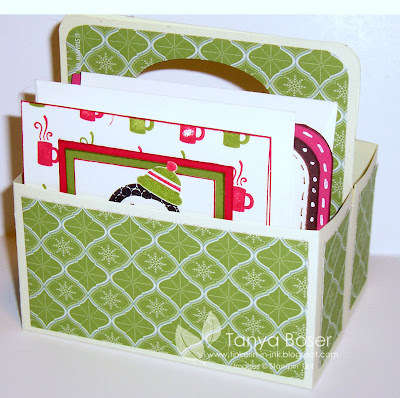 The tutorial for the side step card can be found here. And oops! I just realized this photo is before I put the Platinum Shimmer painted Jumbo Snowflake on the card! And this is the stepped up version, again without the shimmery snowflake I forgot to put on before I took the photo. I needed an embellishment on the card for the swap and I didn't want to hide the DSP I made and I didn't want to add any bulk, so the Silver Elastic Cord did the trick! Have any of you tried this fold yet? Show me what you've done, post a comment and link to yours. 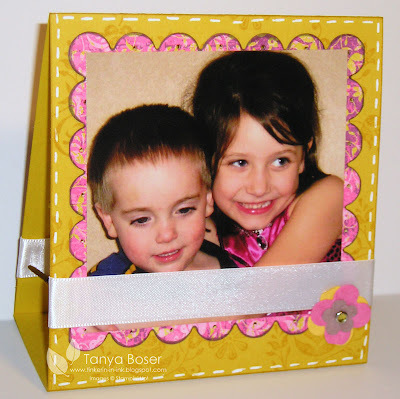 This is a cute little desk top photo stand that I made for the Stampin Addicts 3D challenge here. The 2 cute little kids are my niece and nephew :) This was actually supposed to be narrower, but I used the wrong piece of paper after I cut a full sheet down, oops! Oh well! It still turned out cute. The little flowers in the bottom are leftover Faux Suede flowers I had made this summer for the Mini Album swap I did for convention. I have them saved in an old SU eyelet container on my desk. Saves me time! I also decorated both sides the same so you can put 2 photos on it. This little tree stands all by itself and is very festive! I CASEd the idea from Krystal De Leeuw here. I know, I know, my tree needs some decorations, but I haven't decided exactly how I want to decorate it :) I used the Bigz XL O Christmas Tree die to make the tree, and the Medallion stamp to make the skirt. 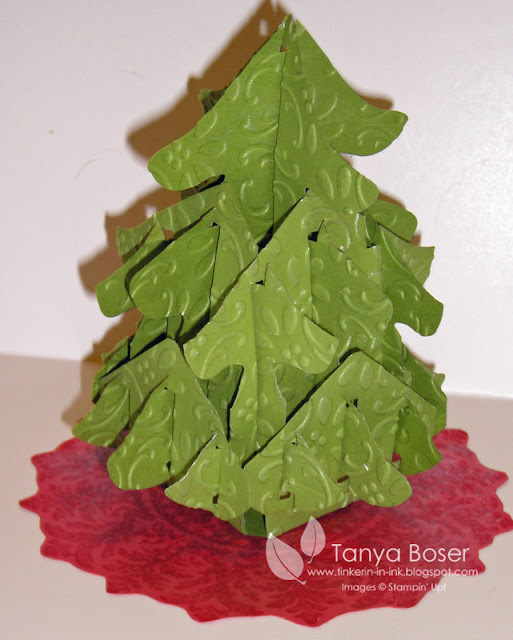 I used the Finial Press embossing folder to texturize the tree. I also sponged Frost White Shimmer Paint all over the whole thing, which just adds more elegance to the whole thing. Yes, I really am addicted to the stuff! Don't you just love it! It will look adorable on my coffee table. I just hope the cats don't turn it into a toy, lol! This is the page we made in club for November. The new Christmas Cocoa DSP is just gorgeous! This was another easy page to make. We stamped, punched, then shimmer painted the ornaments with Frost white. They really shine! The punch makes it so easy to make these accents. I used the Merry Details Sizzlit for the bird, and the Swirls Sizzlet fothe the swirls (duh!). 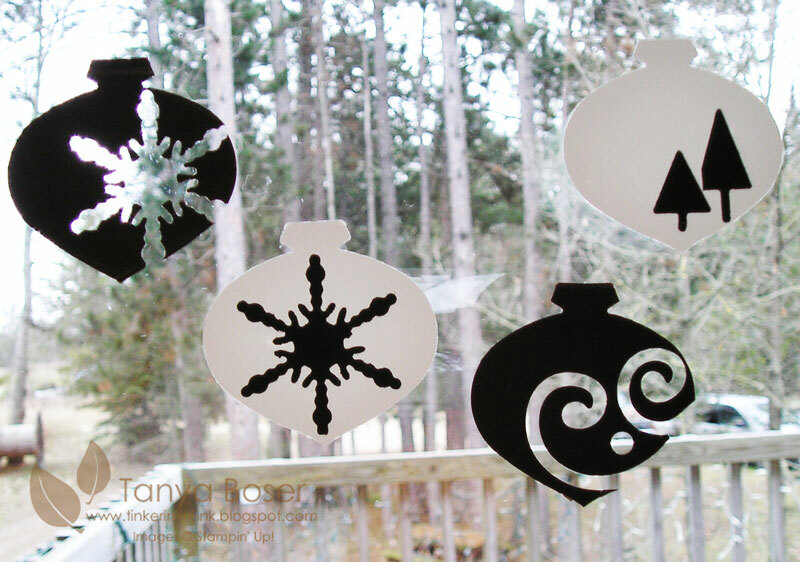 The snowflake and trees are also from Merry Details. Just love how these turned out! I think I will be making some of these for work also! 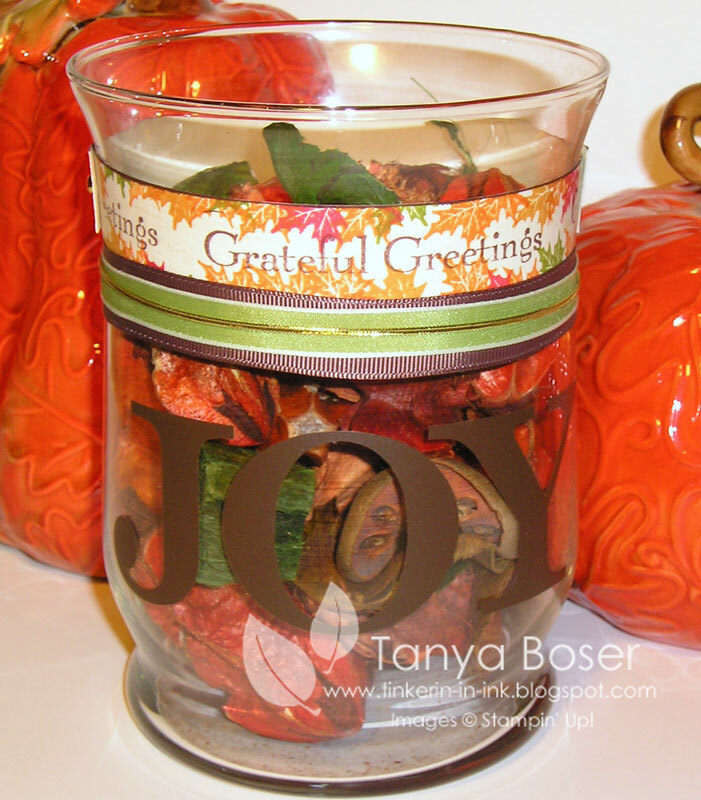 Here is a glass vase that I decorated for the holiday seasons. First I used the Holiday Mix Decor Elements from the Holiday Mini and put JOY on the side, then I wrapped ribbon and a stamped strip of paper around the top. I can change this for Christmas, Valentines, Easter, Winter, Spring, etc! I will post my other versions of this as I make them. Other: Chocolate Chip 5/8" grosgrain and Old Olive taffeta (from Mistletoe Ribbon Originals) and Gold Elastic Cord, Sticky Strip, gold brads, Decor Elements Holiday Mix in Chocolate Chip. To make the stamped strip, I took two 3/4"x7" strips of Naturals Ivory and stamped my design. Then with 2 ends overlapping about 1/2", poked a hole thru with my paper piercer, and fastened with a gold brad. Then on one of the other ends I attached the other brad. I then put a piece of sticky strip on the back over that brad's prongs. I then wrapped it around the vase as desired and stuck it together with the sticky strip. I then wrapped ribbon as shown and adhered just the ends to each other. The gold elastic cord I wrapped snugly around the vase, cut the length, then removed from the vase and tied the ends together. Then made a doubled circle and slipped over the vase and ribbon as shown. All Done! 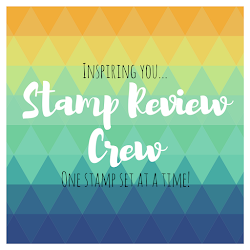 HUGE SALE AT STAMPIN UP! There are great bundles and individual products 30, 40 and even 50% off now thru November 30th. Go check it out. 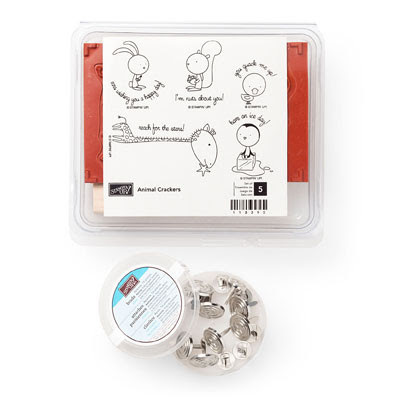 The recipient of this bundle will certainly "quack" up when she sees the adorable animals in the Animal Crackers stamp set. Bundle also contains Star Designer brads and is 50% off its retail value! Nothing says "Merry Christmas" quite like corduroy. 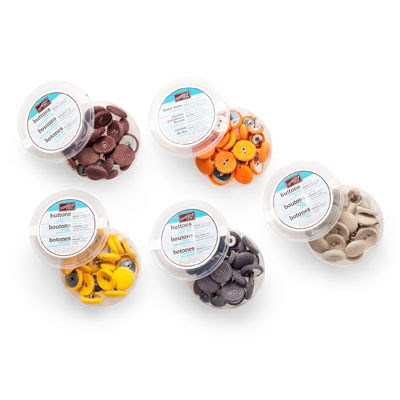 Now you can say it five times with the Corduroy Button Bundle containing buttons in Kraft, Pumpkin Pie, Summer Sun, Basic Gray, and Chocolate Chip. Bundle is 50% off its retail value! Remembering playing Four Square as a kid? That's not what this bundle is about--but it's still loads of fun! 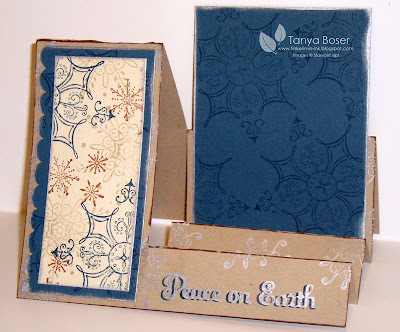 Get the Four Square stamp set and Scallop Square punch at 50% off their retail value! 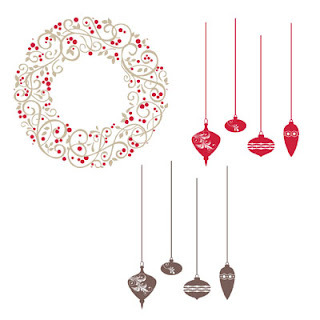 Decorating for the holidays is easy with the Christmas Décor Bundle, containing a Kraft and Real Red Holly Berry Wreath, and Real Red and Chocolate Vintage Ornaments--all 40% off! Make beautiful creations with the Pendant Note Bundle. 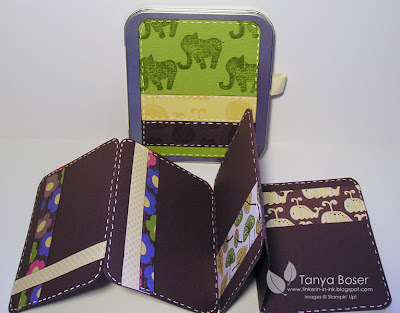 The bundle--30% off its retail value--contains the Pendant Park stamp set, Pendant notes, and 5/8" Neutrals Jumbo brads. THIS BUNDLE IS ONLY AVAILABLE WHILE SUPPLIES LAST. 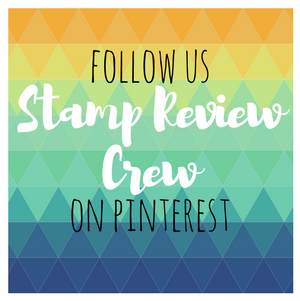 Want to stamp but don't know where to start? 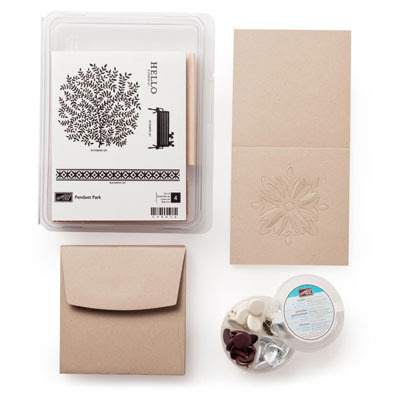 We've got your Ultimate Stampers' Starter Bundle right here! Containing Best Wishes & More, Eight Great Greetings, and On a Pedestal stamp sets, plus Earth Elements Stampin’ Spots, Earth Elements assorted card stock (8-1/2” x 11”), Whisper White card stock (8-1/2” x 11”), Old Olive 1/2" striped grosgrain ribbon, and Flower Designer brads, you'll be in stamping heaven--all for 40% off the retail value! 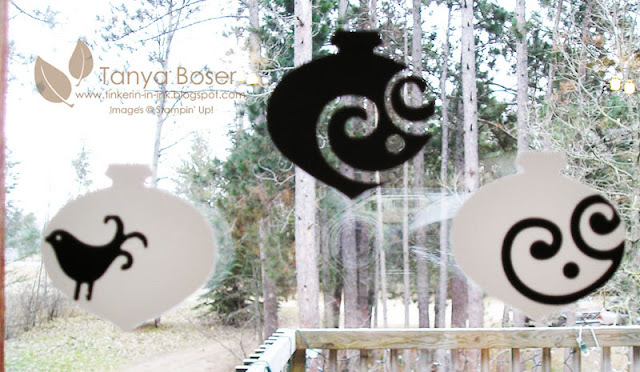 I made the tealight with this design and then thought it would be a good design for a pillar! And lasts longer too ;) The paper strips are glue to each other but not the candle so you can easily remove the decoration when needed. You might even be able to slip it onto another candle. Hmmm.... going to have to try that! I couldn't resist using some of our retired Choc Chic 1" satin ribbon from last year. I'm glad I stocked up and hoarded this stuff! I should have enough to last me for YEARS. I think I bought 6 rolls, shhh don't tell my hubby! Isn't it cool how close the color of this mulled cider candle is to our More Mustard?! I'll post the glass hurricane vase that I made to coordinate with this candle too. I just need to take a picture! Ok, this is a CASE of Jennifer Picard's card here. I changed just a few things but I love how it turned out. This was something I was going to do with club for October, but tying the linen thread to the ribbon was way to putsy to do with a big group, lol! 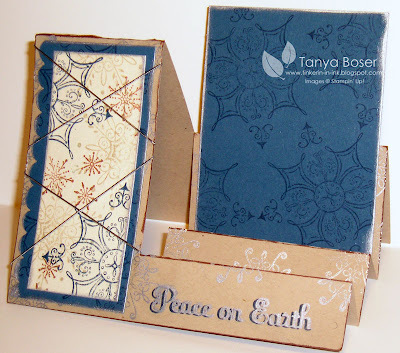 You may have also noticed that I have been using alot of the Naturals Ivory cardstock lately. I love that it is so heavy and makes a great card base, but I also think it has a very rich look to it. Try it sometime, you'll love it too! I also used the Faux Suede technique again here- crumple and distress cardstock with your bone folder, then peel apart into 2 layers. the exposed inside is all soft and fuzzy like suede! And I stamped on the wood sheet and punched out the image, which was not hard at all. The wood sheets are really thin and backed with paper so you can glue it to other things very easily, however I attached mine to the card with a brad :) I also popped up the main image layers with dimensionals. Let me know what you think! I love to hear from you all! This is another card I did for a swap. As you can see, I am still addicted to the Shimmer Paints. I just love the bling you get with that stuff! Remember, it's only available until January 4th, and it is one of those things that they may say, while supplies last after mid December. Ok, enough of that, on to the card! There are tons of layers on this card. I didn't mean for that to happen, I kept adding more! 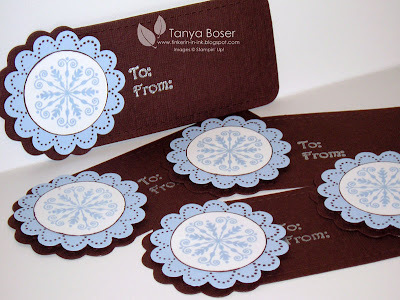 I got to use the Petals-A-Plenty embossing folder, and figured out that the little triple snowflake stamp works well with the Boho Blossoms punch! And don't you think purple, or Rich Razzleberry in the case, is a wonderful color for Christmas?! It's hard to see in the picture, but I stamped Champagne Mist snowflakes all over the ivory paper and sponged the edges with it to. I made my own DSP for this card also. Used markers to ink the Santa, sliegh, and reindeer stamp which made it look so much better than just all one color. I popped up the main image layers on dimensionals also. Hope you like it! Still loving the Cold &Cuddly set! And I found a new-to-me fold called the Side-Step. I love how you can put a picture in this card! I found the original directions from Julie Davidson, but I tweaked it a bit. You start with a 5-1/2"x8-1/2" piece of cardstock. Put in paper cutter with the 5-1/2" side at the top. Line edge up with the 3-1/4" line and cut down starting at 1" and ending at 6-3/8". Turn paper 180 degrees and score all the way across at 4-1/4". Then score from the edge to the cut line on the wider section at 1", 2", 3-1/8", & 6-3/8"
Fold and crease well as shown above. Now, show us what you've got! Post a comment and link to yours! We are making this at club tonight, and if the response I got at work is anything to go by, this is going to be a hit! It would make a great centerpiece on the table, and a lovely gift to the hostess of any dinner party. 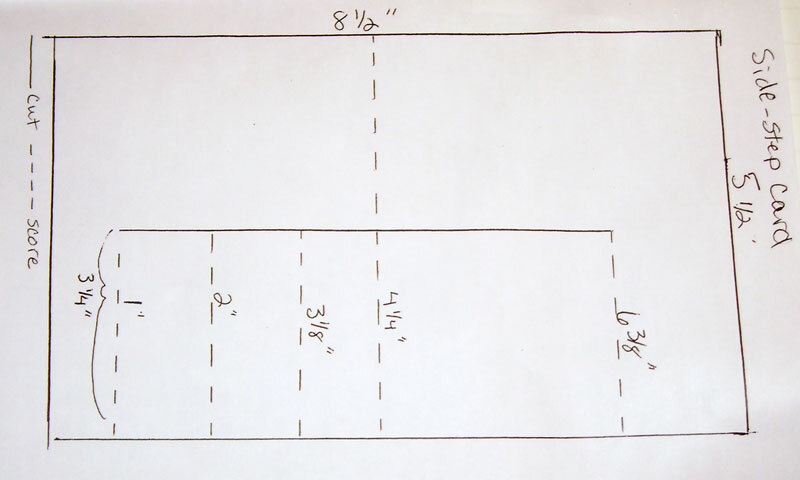 Here is a diagram of the pieces to make the box. 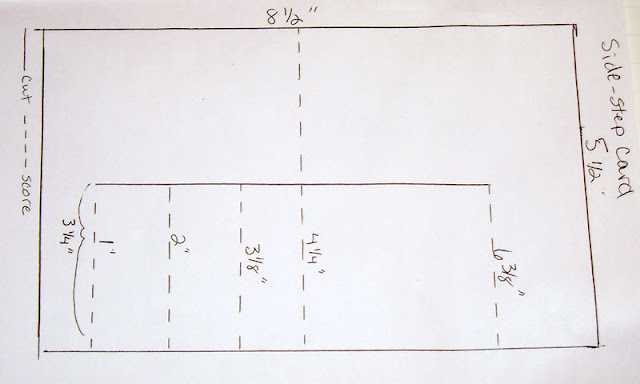 The box starts as a 3-3/4x8-1/4" piece. Your longest score lines are at 1/2", 1-1/8", 2-5/8", & 3-1/4"
Your short score lines are at 1/2", 1-1/8", 7-1/8", & 7-3/4"
Cut out the shaded areas and on the cut line to make flaps. Apply sticky strip to the 4 outer most sections and assemble to box. The box cover is made from a 5x6" piece. Score lines will be 6" long at 5/8", 2-1/4", 2-7/8", & 4-1/2". Crease folds well with bone folder and put sticky strip on one edge flap. Peel the sticky strip and wrap cover around box, adhere flaps together. Fold a piece of tissue paper into 4 layers, and sandwich between 2 layers of copy paper. Puch out your 1-3/8" circles. Leave between the copy paper layers and punch 3 times ine the center with the 1/16" punch to make a hole big enough for the wick to fit thru. Stamp tissue paper with desired images. Slide tissue paper over the wick onto top of the tealight. Put tealight down! Do not hold for this step. Heat top of tea light with heat gun until the tissue paper melts into the wax. All done! Here is another set I made with the same theme and color scheme. Now I want to see what you all come up with! Post a comment with a link to yours so we can all see! So this is the third project we did last month. I know, it's time for another club meeting already! I also posted a very similar card last month, I just changed it a little bit. 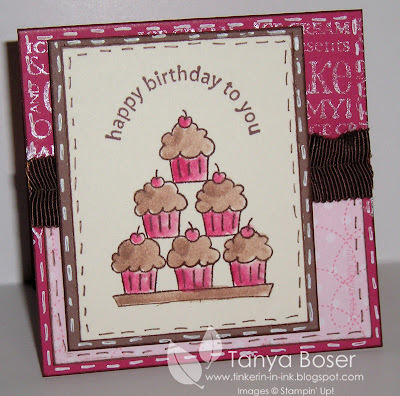 I used a different texture plate (the other one wasn't Stampin Up!) and decided to use the polka dot side of the Dusty Durango ribbon. Otherwise pretty much the same card as here. Ok, now I will work on some posts of more recent stuff! I have so many projects and ideas I want to try, I almost don't know where to start! I just love this die, it is so delicate and pretty! And it looks really awesome here in a dark patterned paper (I know, it's retired, but I needed something I had a lot of). This was a pretty fast project too. Of course, my ladies are getting to be such pros, they can breeze thru a lot of stuff! We stamped different images and punched them out with 3 different sized circle punches,and used a Jumbo Grommet for an accent in the upper left corner with a pretty leave in the center of it. To attach the grommet, I laid the corner of the page on the spongy piece of the mat pack with the hard cutting board piece under the spongy piece, then placed the grommet and leave circle where I wanted it. Then, standing up, pushed down hard with my thumbs to push the prongs thru. Then turned over the page and used the bone folder to bend the prongs out. I really need to take more photos and develop some that I already have! 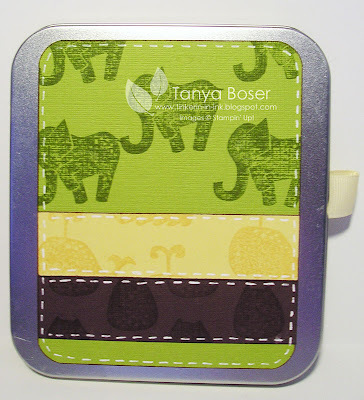 This cute little gut holds a packet of cocoa or apple cider or I'm sure a lot of other things, lol! You just tuck it in at the top. 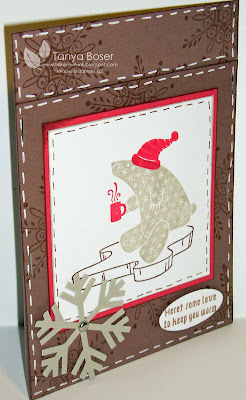 This card is held together with 2 staples in each side, Another quick and easy card/gift. We all got to use the Stamp-A-Ma-Jig (SAMJ) and learn what an awesomely easy to use tool it is, and how fun it is to mask images. For sets like this, I like to make a permanent image sheet (a piece of vellum cardstock) for the SAMJ and masks and keep them in the box with the set. It saves a lot of time. On to the recipe and the instructions! Cut a piece of Close to Cocoa to 4x10", score at 5-1/2" and fold. Cut a Ruby Red 3-3/16" square. Cut a Whisper White 3" square. Punch out a Sahara Sand Jumbo Snowflake. 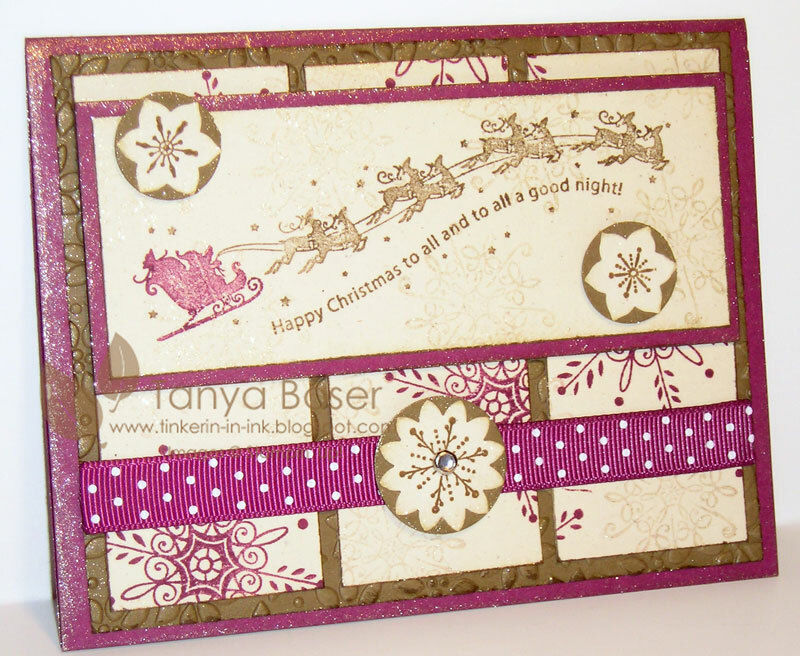 Stamp snowflake image all over card base in Close to Cocoa. Stamp a polar bear on a scrap of paper and cut out, this is your mask. Stamp a polar bear in Sahara Sand on the Whisper white square using the SAMJ, just off to the right slightly. Place polar bear mask over it. Now place your image sheet with the ice flow over the bear image as desired and use SAMJ again to stamp the ice flow in Choc Chip. Repeat process with a Ruby Red hat. You can now remove the mask, and use the SAMJ to stamp a Ruby Red mug. Ink Edges of Whisper White square with Sahara Sand. Ink edges of Ruby Red with Close to Cocoa. Ink edges of card base with Close to Cocoa. Adhere the Whisper White layer to the Ruby Red layer, then adhere to the card base as shown in pic above. Use white gel pen and Choc Chip marker to make the faux stitching as shown. Open card up and lay on the spongy mat pack piece, place the Snowflake punch as shown and pierce thru all layers. Leave on the spongy piece and push the silver brad thru the hole. Then pick up card and open the prongs of the brad. 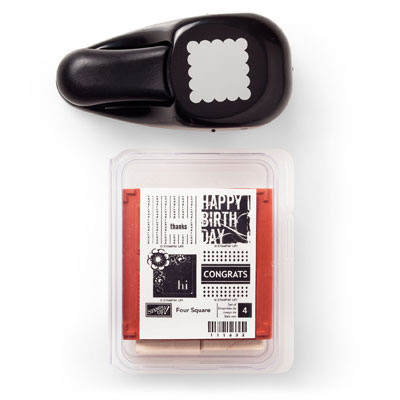 On a scrap of Whisper White, stamp the phrase in Close to Cocoa, then punch out with Small Oval punch. Ink edges with Choc Chip marker. Apply oval to card with dimensionals. With card closed, staple at the top and mid way down on each side, about 1/8" from the edge. Write your message on the back, then insert to treat in the front. All done! This is one of the swaps I made for Chipper's Christmas card swap. I made two :) I am in love with the Shimmer Paints! As of mid October, I used half of each bottle already! I also mixed Soft Suede reinker with Champagne Mist shimmer paint (1 drop reinker to about 3 drops of shimmer paint) and used a sponge dauber to apply the mixture to the polar bear stamp. There is shimmer paint all over this card, lol! 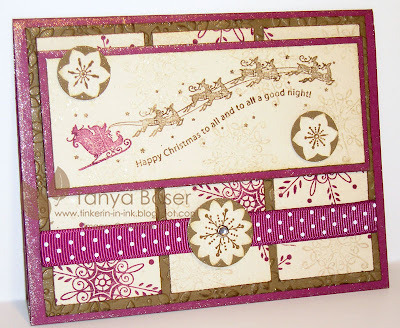 I stamped a snowflake all over the cardfront with Champagne Mist shimmer paint too.